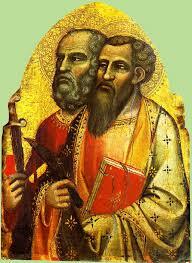 Jude, also known as Thaddaeus, one of the Apostles. He is the patron saint of desperate cases and lost causes. Simon is often associated with Jude. The most widespread tradition is that after preaching in Egypt, Simon joined Jude in Persia and Beirut, where both were martyred. There are numerous accounts of Simon's martyrdom, some believe he was crucified, others think he was sawn in half. Another tradition says he visited Britain—possibly Glastonbury—and was martyred in Lincolnshire. He is patron of sawmen, tanners & woodcutters.